1President Trump’s 2018 State of the Union Address, while commonly recognized as traditional in its use of standard presidential tropes such as strength, unity, and initiative, has yet to be appreciated for perhaps its single most important innovation: the extensive use of real people as iconic illustrations of ideals, values, and attitudes—in other words, as persuasive devices. By bringing together a diverse set of individuals who have succeeded in one way or another, President Trump creates an unprecedently numerous ensemble of common people who are portrayed as heroic figures. This cast of characters becomes the backbone of his speech and a lever for Trump to position himself as the ultimate energetic leader of a thriving America. 2The 2018 State of the Union Address introduces a relatively new tool in the persuasive toolkit of the American president. During previous addresses, presidents would make extensive use of metaphors, examples, hyperboles, antithesis and various other rhetorical tools. They would only briefly acknowledge up to six to seven guests—a relatively late practice, first introduced by Ronald Reagan (Peters). Yet, in no previous presidential address have guests played such a pivotal role in the structure of the speech. Trump’s 2018 address is the first one to systematically employ the personal example of real-life individuals who are present at the speech—as the central persuasive device. He integrates ‘real’ people into a pseudo-fictional context which forms the backbone of his speech. Though still relying on his traditional energetic use of hyperboles and metaphors, Trump supplements his rhetorical arsenal with this unusually large number of real people. He uses them as illustrations of real-life successes and as semi-fictional embodiments of certain American values needed to “make America great again” such as bravery, patriotism, resilience, and perseverance in the face of tragedy. 3Trump manages to achieve a double goal with this innovative combination of personal illustration and direct, informal vocabulary: On the one hand, he employs iconic characters to define modern American values in a way that strengthen his persuasive strategies; on the other hand, they allow him to solidify his position as the ultimate American leader by positioning himself as superior to those heroes. 4My analysis will focus on two key aspects related to Trump’s use of real people to illustrate his points; on the one hand, the use of metaphorical language to portray the individuals as iconic embodiments of American values; on the other hand, Trump’s use of language to place himself in a position of superiority to these iconic characters, thereby establishing his authority as ultimate American leader. 6As mental structures, frames are based on a series of rules which apply differently depending on the type of framework employed at a certain time. As Goffman explains, “we tend to perceive events in terms of primary frameworks, and the types of framework we employ provides a way of describing the event to which it is applied” (Frame Analysis 24). In other words, a certain frame will have its inherent rules for decoding a message, depending on its particular nature. Goffman uses examples such as the game of chess, which has rules directing both the nature and the direction of possible movements, and the system of traffic regulation codes, which directs the nature of the possible movements but not the direction. 8In the first part of my analysis, I will use these theoretical and practical foundations to analyze the way Trump constructs a heroic/mythical framework in which to introduce his guests and identify the linguistic markers through which he achieves this. In commenting on the significance of this narrative strategy, I draw on recent research on the efficiency of narrative persuasion in changing strong attitudes, including the works of, among others, Dal Cin, Zanna, and Fong. Based on an analysis spanning diverse academic disciplines—including social psychology, communication studies, stylistics, and rhetoric—they suggest that integrating an argument into a narrative frame is an effective strategy to overcome resistance, reduce the barriers associated with identifying a more obvious persuasive attempt, and diminish the receiver’s ability to think of counterarguments (177). I will use these concepts to analyze Trump’s socio-rhetorical positioning, on the one hand, and the linguistic means he uses to consolidate it, on the other. 11The context in which these characters are introduced is important for their position in the conceptual structure of the speech: They have been “forged” by the “floods and fires and storms” of various tragedies; they are the “steel in America’s spine.” The metaphorical trinome of the fire-forge-steel, with its positives (“steel”) resulting from the negatives (“fires” and “hardships”) through the process of forging, is a powerful background for the idea that whatever difficulties befall the American people, their ultimate effects are positive. This idea is in line with the general optimistic tone of the speech, while also playing an important part in defining the energetic, heroic atmosphere of the address. 12Donald Trump first refers to U.S. Coast Guard aviation electronics technician Ashlee Leppert as an example of American heroism. 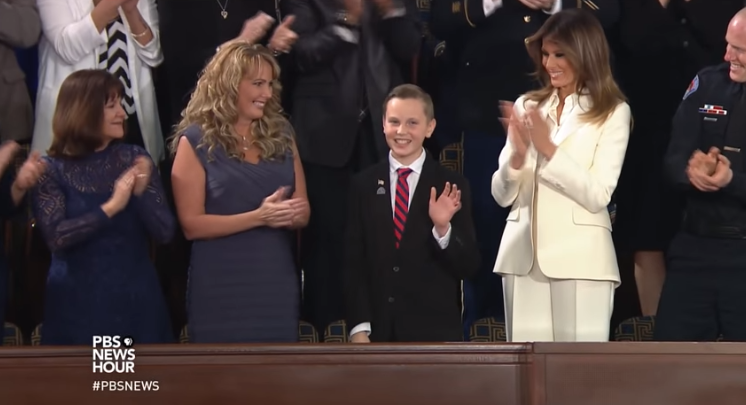 His heroic status is defined explicitly by introducing him as a legendary character: “We heard tales of Americans like Coast Guard Petty Officer Ashlee Leppert, who is here tonight in the gallery with Melania.” People generally hear tales of heroes and heroic deeds, of villains and infamous tragedies—in other words, of uncommon characters and events. Choosing this frame is an efficient means of ensuring that officer Leppert, as first in a series of semi-legendary characters, is viewed as a heroic figure who will be joined by more exemplary figures throughout the speech. 13It is important to notice that “We heard tales” is immediately followed by “of Americans,” rather than by directly naming Ashlee Leppert. This integrates Leppert in a larger category of American heroes while also publicly recognizing the existence of this category and introducing it into the larger framework of the speech. In other words, it is immediately after framing the presentation of the individuals as “heroes” that Trump introduces the idea that there is such a general category as that of the American hero, to which Ms. Leppert belongs. This strategy is slightly awkward in that the exceptional implied by the “tales’” framing is thwarted by the collective nature of “Americans like… .” However, in this context, it is a stylistically creative way of conveying the existence of such a class as the American hero—an open-access class, available to virtually any American citizen—and that representatives of this class are associated with Trump and brought before the public eye. 14The story of Leppert, the hero, is synoptically presented in a way that is easy both to follow and remember: “Ashlee was aboard one of the first helicopters on the scene in Houston during Hurricane Harvey. Through 18 hours of wind and rain, Ashlee braved live power lines and deep water to help save more than 40 lives.” The heroic language is clear: “18 hours of wind and rain” and “braved live power lines and deep water” both suggest the extreme difficulty of the situation and are filled with heroic implications. In fact, the only two actions attributed to Leppert—“braved” and “to help save”—belong to the semantic field of the hero and clearly frame Ashlee Leppert as such, while the overall structure of the short narrative—a hero is in a dangerous situation and performs heroic actions to save the vulnerable—is a textbook (albeit highly concentrated) example of the story of the archetypal hero. 15Trump employs the same strategy of creating a pseudo-fictional context for each of the guests/heroes for no less than eleven of the eighteen persons who are either mentioned or present. The story of David Dahleberg begins with “We heard.” The anaphoric use of the term is a clear indication of the strength of the narrative/fairy-tale-like frame in Trump’s speech, with the rest of the story fitting the frame perfectly: “David faced down walls of flame to rescue almost 60 children trapped at a California summer camp threatened by those devastating wildfires.” The single sentence contains the key ingredients of a heroic story: the hero (David), the dangerous context (“faced down walls of flames,” “threatened by those devastating wildfires”), the admirable deed (“rescue”), and the vulnerable (“almost 60 children trapped”). It is, much like Ashlee Leppert’s story, a concentrated and extremely effective way of introducing the character as an archetypal hero. 17The persuasive efficiency of this strategy—introducing brief narrative passages to support a specific argument—has been recognized by scholars including Dal Cin, Zanna, and Fong. According to them, narrative persuasion is effective in two main ways: “First, narratives may overcome resistance by reducing the amount and effectiveness of counterarguing or logical consideration of the message. Second, narratives may overcome resistance by increasing identification with characters in the story” (177). Trump achieves both functions through the use of short narratives that introduce each of the heroes, which allows the president to simultaneously direct the audience’s attention to the engaging nature of each story while implicitly and explicitly encouraging the public to identify with the protagonists. 18For the purpose of this paper, it is not necessary to analyze every introduction of the real-life person as heroic—or at least iconic—characters. A brief overview of the way some of them are presented is illustrative: Corey Adams is referred to as “an all-American worker”; Preston Sharp belongs to the category of “young patriots”; Ryan and Rebecca Holets “embody the goodness of our nation.” The use of such inclusive language encourages the audience to identify with the characters while also fostering a sense of community. The speech thus reinforces its message by heavily relying on the unprecedented number of guests attending the State of the Union Address and achieves its goal to promote the values of a united American community that each and every one can belong to. 19Trump manages to portray a set of real-life individuals as iconic American characters by introducing them within a pseudo-fictional, legendary frame and by referring to them as iconic representatives of an entire category with whom the public can identify. 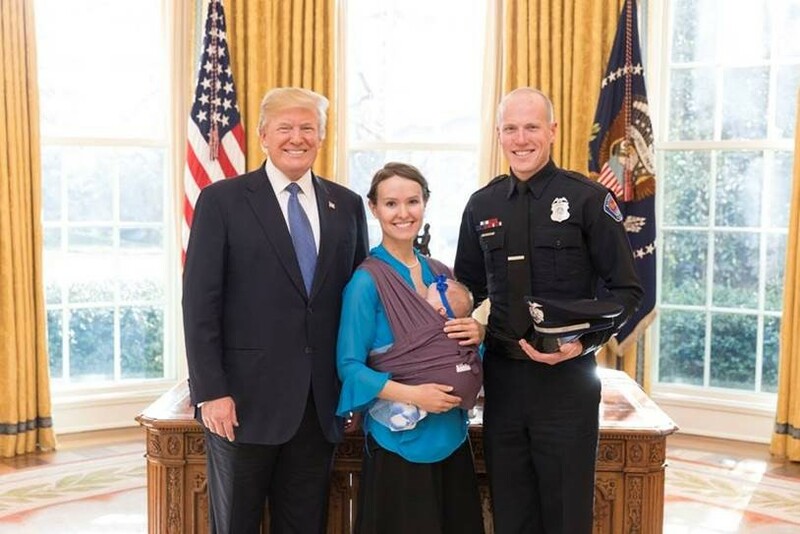 Trump’s heroes, while still retaining their unique features, become exemplary representatives, a whole cast of characters thus turned into all-American hero icons. They thus serve as a unitary persuasive device. Each hero remains relevant for a specific segment of the population—Preston Sharp for young American patriots, Corey Adams for the American workers, Leppert for servicemen and women, etc.—but together they stand for one main idea, expressed by Trump at the very beginning of the speech: “Each test has forged new American heroes to remind us who we are, and show us what we can be” (emphases added). The importance of having a cast of real-life heroes supporting that final statement cannot be overstated: It brings the necessary concreteness to what would otherwise have been an utterly conventional and traditional conclusion to a lengthy address. Being “proud of who we are” is much easier when “who we are” is a set of archetypal heroes. Similarly, “confidence in our values” comes much easier when those values are not just empty words but hammered home throughout the speech and portrayed in flesh-and-bones individuals. Finally, the closing paralleling structure “our Nation will forever be safe and strong and proud and mighty and free” acquires a concrete meaning since each of the attributes has been rendered concrete by a real-life character. 21According to the official website of the Merriam-Webster dictionary, one of the definitions of “to leverage” is “to use for gain,” with the suggested synonym being “to exploit” (“Leverage”). This is close to my understanding of the concept as applied to Trump’s address, in that the primary role of integrating the cast of heroes in his speech was to use them for political gains, and thus, in a way, exploit them. The nature of this exploitation, however, is exclusively rhetorical; not a single individual has had to suffer any type of harm as a result of being featured in Trump’s speech. On the contrary, it can be argued that being physically and metaphorically present in the speech has brought massive well-deserved attention to a number of causes which are both positive and, often, in desperate need of public attention. In practical political terms, thus, I do not consider that any of the participants in Trump’s address were exploited. Like many other ethical and political considerations, however, these questions are beyond the scope of this paper. 22This preliminary observation is nonetheless necessary because it touches on the ambivalent nature of the concept of leverage, an ambivalence which is perfectly applicable in the context of Trump’s address. As I will attempt to prove, from a strictly rhetorical standpoint, the negative nuances of the term are justified. In what might seem to be a circular motion between the rhetorical and the social, Trump’s leveraging of the heroes, while arguably positive in terms of political consequences, is not entirely positive from the perspective of the power relations established between the president and the iconic cast of characters brought before the public eye. Thus, in what has become typical of Trump’s public presence, we are faced again with the potential ambivalence of his direct and transparent willingness to solidify his authority and consolidate his position of dominance even while drawing attention to praiseworthy All-American heroes. 23I identify, thus, two separate goals in Trump’s speech: on the one hand, he instills the idea that America is a strong nation of resilient citizens who are always ready to overcome adversity and ascent to the realm of heroism; on the other hand, he consolidates his position as a strong leader who actively dominates the ‘heroes’ and who, implicitly, is above even this highest category of American national accomplishment. 24To say Trump is a controversial character is almost an understatement; according to an ABC News study, the ten most common words Americans use to describe Trumps include extremes such as “incompetent” and “strong,” “ignorant” and “great,” as well as “racist,” “egotistical,” “narcissistic,” and “idiot” (Verhovek). The spectrum becomes even wider if we analyze Trump’s image as portrayed in the mainstream media, with frequent representations in the left-leaning media including Trump either as an impulsive, infantile leader or as a downright threat to America and the world, while conservative outlets typically portray him as a popular hero, albeit a bit rough around the edges. Regardless of political stance, it seems quite clear that Donald Trump tends to be seen as a polarizing, dominant, even potentially dangerous, figure. 25A solid illustration of this dominance-asserting behavior is his infamous handshake—a strong pulling-and-shoving gesture which often causes the interlocutor to lose balance in the process. In a TIME analysis, body language expert India Ford described Trump’s handshake with France’s president Emmanuel Macron as an intentional way to establish his hierarchical position: “What Trump is doing here is showing Macron who’s boss. It’s another aggressive move by Trump; he’s pulling Macron towards his own face and he’s basically saying ‘you will come to me, whether you like it or not’” (Samuelson). President Trump’s State of the Union Address is thus one more opportunity to consolidate his image as the supreme all-American leader, this time by establishing his hierarchical superiority over a cast of characters which he introduces in strong heroic, iconic terms. In other words, on this occasion he will not attempt to dominate a single interlocutor, but rather a group of extraordinary characters—thus achieving a position which might accurately be described as one of super-hero, since it actually implies hierarchical superiority over a number of American heroes. 26One of Trump’s most important strategies to minimize the difference between himself and the ‘heroes’ he introduces to the public is to address them by their first name. Though standard practice in everyday life, this is not at all common in such a formal context as an address to the whole nation: “Ashlee, we all thank you”; “Thank you very much, David. Great job”; “I think they like you, Steve”; “Corey, please stand”; “Preston, a job well done,” etc. Chilton, among others, has noted that different forms of address can be indexical expressions of social distance (201); in the context of Trump’s address, the dimensions of this social distancing—or rather, closing of the distance, since first-name address is a marker of intimacy—are even greater considering that the addressees have just been introduced as heroes. What this strategy manages to achieve is to simultaneously bring Trump closer to the guests while also creating a hierarchical relation of dominance by using a relatively intimate form of address in an otherwise obviously non-intimate context. As Brown and Levinson noted, “intimate stuff used non-intimately takes on a different, but highly predictable, meaning, namely the symbolism of dominance (a prototype for which can be found, perhaps, in the relation between parent and child)” (46). 27This relation of dominance is further consolidated by Trump’s construction of a context not at all unlike that of The Apprentice: a setting with a relatively relaxed atmosphere, yet clearly unidirectional in terms of power relations, in which the boss—in this case, obviously, Donald Trump—gives the final verdict on the performance of a series of potential ‘apprentices.’ He thus expeditiously praises David Dahlberg with “Great job,” a clear marker of superiority in terms of power positions, instructs Corey Adams to “please stand” and, immediately, adds his opinion on his professional skills (“he’s a great welder”), an aside which is received with a round of laughter from the audience. Similarly, he makes the same type of humorous evaluation after he introduces “the legend of Louisiana,” Congressman Steve Scalise: “I think they like you, Steve.” Again, this remark is met with another round of laughter. 28It is important to note that these short remarks are made immediately after introducing a ‘hero’ and briefly presenting their merits, a crucial moment which ensures maximum impact in terms of hierarchical positioning: In each of these cases Trump asserts his dominance by using an intimate form of address or making an evaluative statement right after he has presented a character as a contemporary hero. In a way, this strategy is not unlike his trademark handshake—aggressively asserting his dominance after the initial moment of acknowledging the merits (or, in the case of the handshake, formally paying respect to) his interlocutor. 29The 2018 State of The Union Address is unique in that president Trump integrates the presentation of real-life individuals into a larger persuasive strategy. In the first part of the paper, I have analyzed the way Trump uses a fairy-tale/legendary frame to portray the guests as heroic, all-American figures, and encourage the public to identify with them. The use of brief narratives with the introduction of each guest is an efficient persuasive strategy, as it averts critical analysis, increases audience engagement, and facilitates identification with the characters. The second part of the paper focuses on the way Trump positions himself as hierarchically superior to the ‘heroes’ by addressing them by their first name and making evaluative statements regarding their performance—a common practice in the interactions between employer and employees. The overall effect, thus, is the rhetorical use of the cast of heroes-essentially, real-life guests invited to the occasion-to highlight the super-heroic figure of Trump himself, and thus positioning the president as the ultimate all-American superhero. 30The implications of this strategic leveraging of real-life individuals for persuasive purposes can be further analyzed through the lenses of a wide range of disciplines. Questions such as those concerning the ethical implications of using real-life individuals (which have, in some cases, experienced genuine tragedies) to create a certain presidential image, the potential political stakes involved in such strategies, and their socio-cultural impact can be fruitful avenues for further research for scholars in areas as diverse as philosophy, political studies and sociology, cultural and media studies, and others. All of Donald Trump’s unattributed quotes are taken from the online version of his State of the Union Address, available at WhiteHouse.gov (see Trump). Adams, Scott. Win Bigly:Persuasion in a World Where Facts Don’t Matter. New York: Portfolio/Penguin, 2017. Digital. Agha, Asif. Language and Social Relations. Cambridge: Cambridge UP 2007. Print. Brown, Penelope and Stephen C. Levinson. Politeness: Some Universals in Language Usage. Cambridge: Cambridge UP, 1987. Print. Chilton, Paul. Analysing Political Discourse: Theory and Practice. London: Routledge, 2004. Print. Dal Cin, Sonya, Mark P. Zanna, and Geoffrey T. Fong. “Narrative Persuasion and Overcoming Resistance.” Resistance and Persuasion. Ed. Eric S. Knowles and Jay A. Linn. London: Erlbaum, 2004. 175–92. Print. Goffman, Erving. Frame Analysis: An Essay on the Organization of Experience. Boston: Northeastern UP, 1986. Print. Goffman, Erving. “The Nature of Deference and Demeanor.” American Anthropologist 58 (1956): 473–502. JSTOR. Web. 2 Aug. 2018. Lakoff, George. Don’t Think of an Elephant! Know Your Values and Frame the Debate: The Essential Guide for Progressives. White River Junction: Chelsea Green, 2004. Print. “Leverage”. Merriam-Webster.com. Merriam-Webster, n.d. Web. 30 July 2018. Peters, Gerhard. “Guests Sitting in the House Gallery During State of the Union Addresses.” American Presidency Project, Ed. John T. Woolley and Gerhard Peters. Santa Barbara: U of California, 1999–2018. Web. 2 August 2018. Samuelson, Kate. “Donald Trump’s Awkward Moments at the NATO Summit, Analyzed by a Body Language Expert.” Time.com. 26 May 2017. Web. 30 July 2018. Thibodeau, Paul H., and Lena Boroditsky. “Metaphors We Think With: The Role of Metaphor in Reasoning.” PLoS ONE 6.2 (2011): e16782. doi:10.1371/journal. pone.0016782. Web. 30 July 2018. Trump, Donald J. “President Donald J. Trump’s State of the Union Address.” White House, Washington, DC. 30 Jan. 2018. WhiteHouse.gov. 30 July 2018. Verhovek, John. “10 Most Common Words Americans Use to Describe Trump (POLL).” ABCNews.go.com. 30 Sept. 2017. Web. 30 July 2018. Radu-Florentin Diaconu is a PhD student in Philology at Alexandru Ioan Cuza University of Iaşi, Romania. His doctoral thesis is titled “The American Presidential Discourse: A Brief Socio-Rhetorical History of US Presidential Speeches, from Theodore Roosevelt to Donald Trump.” He has previously published Romanian literature reviews in Revista Timpul. Diaconu, Radu-Florentin. 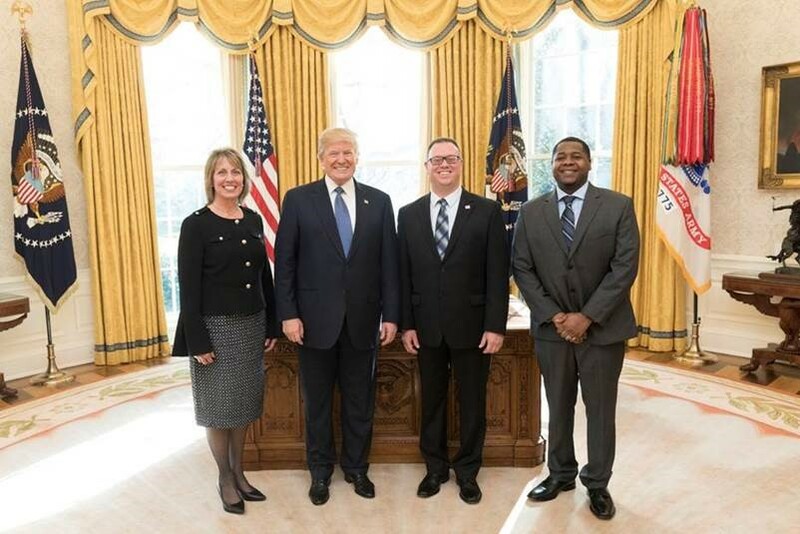 “Leveraging the Hero: Witnesses and Personal Stories as Persuasive Devices in Trump’s 2018 State of the Union Address.” American Studies Journal 66 (2019). Web. 24 Apr. 2019. DOI 10.18422/66-02.